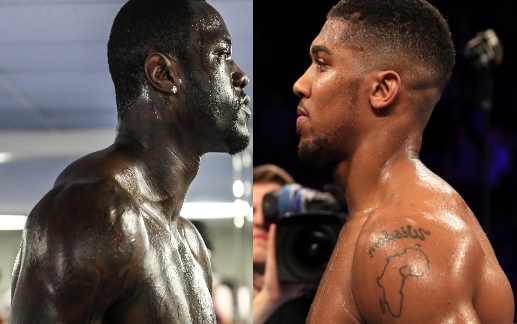 Wilder: Joshua is Either Scared or He's Doping - Make The Fight! WBC heavyweight champion Deontay Wilder (38-0, 37 KOs) is not happy with some of the recent reports that he's read, indicating that IBF, IBO, WBA heavyweight champion Anthony Joshua (19-0, 19 KOs) would require more time to get prepared for a potential unification between them. On October 28th in Cardiff, Joshua will make a mandatory defense of his title against Kubrat Pulev of Bulgaria. And then a week later, on November 4th at Barclays Center in Brooklyn, Wilder will defend his belt against mandatory challenger, Bermane Stiverne. Joshua's promoter, Eddie Hearn of Matchroom, would like to make that big unification for next summer. But based on what Wilder's read, Joshua may not be ready until 2019 or 2020. He believes Joshua is waiting for him to get old - which is what Wilder says the unbeaten Brit did to Wladimir Klitschko earlier this year. In less than two years, three of Wilder's opponents have fallen out due to failing pre-fight drug tests. He wonders if Joshua is postponing their meeting in order to avoid a random drug testing protocol, which is mandatory for any fight involving a WBC world title. "I just want to know what the hell is going on in the heavyweight division? I have just woken up to multiple articles from Anthony Joshua saying he isn't mentally, physically or emotionally ready for me. He may take up to 2020 until he can build up the courage to really fight me. Basically he is trying to get me old. I ain't getting old any time soon. Trust me," Wilder said. "I am the most feared heavyweight in the division. None of the best don't want to go down and lose their record. Eddie Hearn told me Joshua will knock me down in three. Then let him fight me! It's either two things, you're scared or you're doping. Make the motherf***ing fight then, why you scared?" Wilder using WBC/VADA to hide from everyne he doesn't really want to fight. [QUOTE=vitali1999;18124486]Too bad do sad, at least you don't know your stuid [/QUOTE]You're stuPid Priceless, lmao. [QUOTE=vitali1999;18122941]Why, why should he fight him. He has all the other belts, BUMSQUAD is the one who needs to fight him. And needs the payday[/QUOTE] Just can't fix stupid.